I understand that sincerity is usually the best way to get results, so I hope you have a good sense of humor while you read this. My concern today has to do with the 3 mile bend dog park. Hundreds of people use this dog park on a daily, to weekly basis. I myself, go twice a day. I am a new mom, and must keep my baby in her stroller to ensure that she stays warm. The problem is, the trails are never plowed, and clearly need maintenance. Not only is Walking 3 km in soaking wet runners, or stiff rubber boots my idea of an ideal brisk walk; but My biggest problem with the trails being unplowed is how bumpy they are. Im not sure if you have children of your own, or have had the opportunity to push a baby in a stroller down a bumpy trail, so allow me to enlighten you... when babies are buckled into a stroller, their wobbly little heads bounce all over the place. A lot like those ridiculous dash board bobble heads... Perhaps if the trails arent going to be plowed, warning signs should be posted stating "warning to all mothers with strollers, shakin baby syndrom may result due to bumpy paths". I hope that this problem can be addressed, and our cities walkways wont go overlooked. (understandable if it isnt, the snow will melt soon enough im sure). 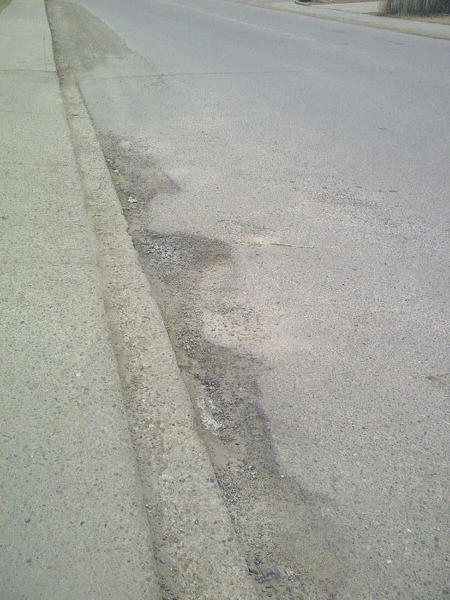 The condition of the sidewalk in front of 73 Dempsey St needs to be assessed for potential replacement. Thank you for your SeeClickFix request. A service request has been generated to assess the sidewalk. As you turn OFF 43rd Avenue on to westbound 32nd Street, there are crater size potholes. Thank you for your SeeClickFix report regarding potholes. A service request has been generated. Thank you for your SeeClickFix request. This report is now closed. The sidewalk and drain at the intersection of Randall and Rogers is caving in. The original hole on the sidewalk was paved, but this is now also caving in. A small child could actually fall into the drain. This needs repair - it's the 3rd year and it's only getting worse. Thank you for your SeeClickFix report. A service request has been generated with Enviornmental Services to repair the catch basin. Public Works will repair the sidewalk after the catch basin has been fixed. Thank you for your SeeClickFix request. A service request has been generated. The back lane between 38 Shaw Close and Sutherland Close has an excessive amount of clay and silt on it. The north end of the alley, near the storm water drains, is especially bad in wet conditions. When it rains heavily silt accumulates, and has to be moved by wheelbarrow. This lane has been a constant mess since the development was created, and is only getting worse as more people are using it to park in there backyards. Thank you for your SeeClickFix request regarding a lane. A service request has been generated. Alley is full of potholes impossible to avoid unless I want to scratch my car some more on a hedge that borders this alley. Thank you for your SeeClickFix report regarding an alley. A service request has been generated to grade the alley when weather permits. Thank you for your SeeClickFix report. This report has generated a service request to assess the sidewalk. Thank you for your SeeClickFix request regarding a sidewalk. A service request has been generated to assess the sidewalk.